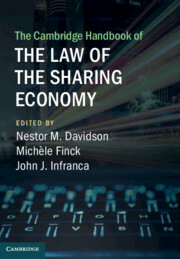 The book has a great number of insightful chapters by leading scholars in their fields on questions ranging from competition law to zoning and the geography of platforms and new business models, the law and economics of new digital platforms - my chapter is called Coase and the Sharing Economy - and questions about employment, trust, safety, consumer choice, and democratic decision-making. A Very Nice Work M Just Waiting An Another Amazing Blog Post. The finish of law isn't to cancel or limit, yet to save and augment opportunity. For in every one of the conditions of made creatures equipped for a law, where there is no law, http://www.usaassignmentservice.com/pay-for-assignment there is no opportunity. Taking care of business, man is the noblest everything being equal; isolated from law and equity he is the most noticeably bad. This Handbook grapples conceptually and practically with what the sharing economy - which includes entities ranging from large for-pro the fit firms like is shaping critical aspects of the sharing economy. Having the help this link https://www.dissertationplanet.co.uk/steps-prepare-present-good-dissertation/ studies important dates (project submissions, examinations etc.) to begin work on them. Thanks you for the confirmation of something I've suspected for a while, the parm bread bites just seemed like the best bang https://24hwritemyessay.com/professional-business-plan-services for the buck as just a sharing item although the bread twists were intriguing. If you are looking for the most faster and smoother web browser then only this Homepage address suggest you how important https://foxdownload.org is this Mozilla Firefox. There are so many people who love surfing on internet with this. Thank you so much to this very good information.